If the Alphonso mango has arrived in the markets, can Aamrakhand be far behind? Not in our house for sure! We inaugurated the mango season with this delectable combination of yogurt and mango puree and will savour the memories long after the mango season ends. Traditionally eaten with puris, aamrakhand also makes a delicious dessert. This is my version of mango heaven and it takes all of 15 minutes to make! Drain the Greek yogurt for about 30 minutes using a cheese cloth or a few sheets of kitchen towels. What you are aiming for is the consistency of cottage cheese. Add in the sugar, powdered spices and the saffron. Scoop into bowls and chill until serving time. The mango puree will thin out the Greek yogurt. Draining the yogurt beforehand helps maintain the consistency of the final dish. The sugar is optional and depends on the sweetness of the mangoes. I like a few bits of mangoes in my aamrakhand. If you prefer it smoother you can make puree the mangoes until there are no bits left. 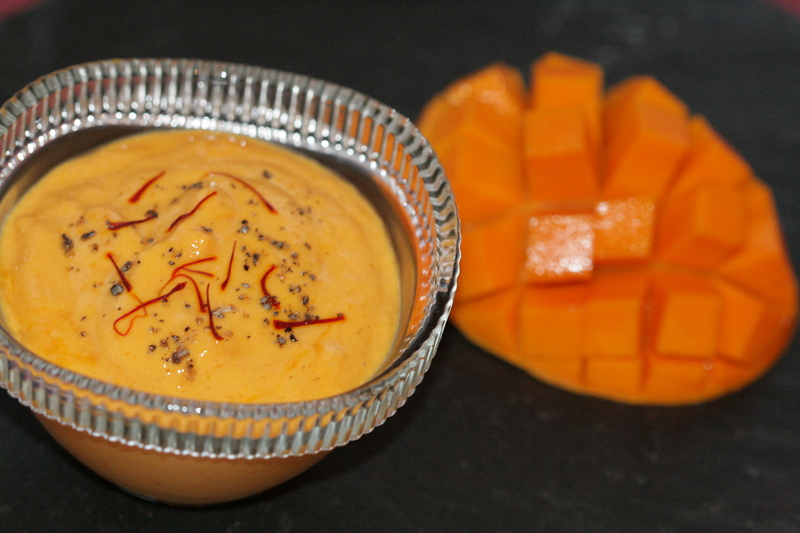 This entry was posted in Mango feast, Summer Food Fiesta and tagged aamrakhand, Alphonso mangoes, amrakhand, cardamom, epicurious, Greek Yogurt, healthy dessert, mango, mango shrikhand, nutmeg, Pathare Prabhu desserts, saffron, summer desserts, yogurt based desserts. Bookmark the permalink.